for tired, neglected hiking feet? It's important for you to know that no financial relationship exists between Hiking For Her and Colorado Aromatics. Which removes any incentive to say nice things about a product, and instead, to focus on facts. The Sole Pleasure Foot Butter was provided by the company as a free sample, in a 4 ounce metal tin. It's also available in a 2 ounce tube. Hiking For Her took it from there. 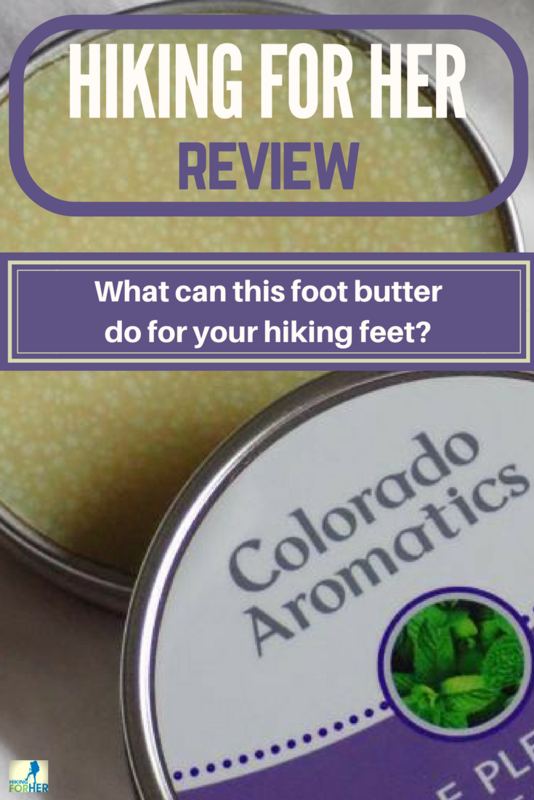 Total: 55 miles of hiking and walking while using the product in this Colorado Aromatics foot butter review. All photos, comments and opinions belong to Hiking For Her. If you were reading a Hiking For Her gear review (a backpack or a pair of boots, for example), this would be the gear specifications section. Instead, we'll take a glance through the product ingredients and point out a few noteworthy details specific to hikers. Our skin is at risk for damage from UV radiation, desiccating winds, temperature extremes, and dehydration. The word emollient is a heads up that this product acts as a moisturizer. Colorado Aromatics selected olive oil, shea butter, and black seed oil as emollients, plus beeswax and other oils from seeds such as cacao and sunflower. See how rich and creamy it looks? Your fingers are going to love how silky smooth it feels as you spread it on your skin, too. Glance through this list of plant ingredients, using your imagination to conjour up each of these delightfully fresh plant aromas. There are no petroleum products, no harsh chemicals or perfumes, no weird dyes or stabilizers. As with any new herbal product applied to sensitive or allergy prone skin, test a small patch of skin before committing to whole body usage of this unique formula. It's amazing how much mileage we put on our feet as hikers, without much devotion to basic self care (or is it just me?). When it was time to sit down and apply this foot butter to my feet, I was somewhat alarmed completely horrified at how many deep cracks had formed on my heels over the winter. What better incentive to rub this product into my heels, and massage it into the skin of my feet, nightly for a week or two? The shallow cracks are gone. The deep ravines are much improved. All of the skin on my feet feels more supple, which is not a small thing for a 60+ year old hiker. This little ritual is going to become permanent, based on how much better my heels look! And setting vanity aside, it's just smart to keep your epidermis in one piece when you're jamming your feet into dirty boots on backpacking trips and backcountry explorations. In a warm shower, use a natural volcanic pumice stone to loosen the dead layers of skin on your heels. A towel generating some vigorous friction afterwards will remove the layers and give you a "fresh" surface. Apply a big dollop of Sole Pleasure to each foot, and use anything extra on your hands. Pull on clean socks, hop into bed, and dream of fields of fresh, aromatic herbs. 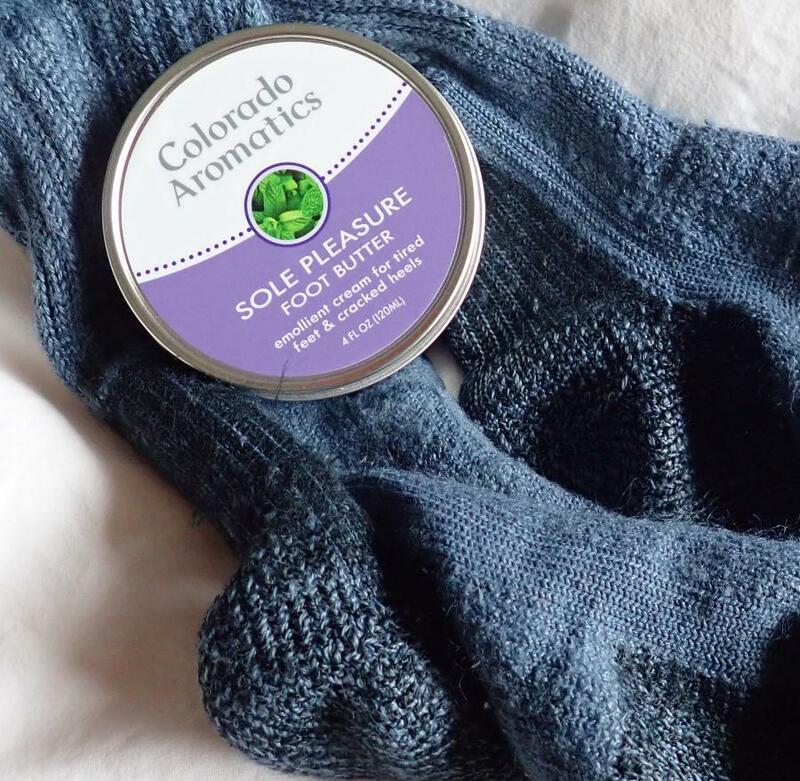 The product featured in this Colorado Aromatics foot butter review is fresh and aromatic on purpose! If you find herbal odors unappealing, this product may be too strong for your olfactory bulbs (which are extensions of one of your cranial nerves, tasked with gathering information about odors in your environment). On the other hand, the aroma is much more pleasant than Essence of Hiking Socks. Because of the naturally fragrant formula, this product is best used in the bear free sanctuary of your home. Unless you live in a bear sanctuary. But then, you're on a first name basis with the bruins and won't mind when they eat your foot butter. Any woman led company gets a close look from Hiking For Her. This one in particular deserves a shout out for its commitment to best practices and science based decisions. Dr. Cindy Jones is CEO and founder. She is a researcher, educator, and natural cosmetics consultant. Her deep knowledge of plants guides her choices for formulas rich in anti-oxidants and anti-inflammatories. She and her husband own and operate their Certified Naturally Grown farm at high altitude (5K feet) in Colorado. She sources over 30 different herbs and vegetables used in her skin care products from her farm. Scientist, outdoor enthusiast, farmer, herbalist... your skin is in good hands with this woman. The answer to the question posed in this review is a resounding "plenty!" Preventing cracks and fissures in your skin robs microorganisms of an entry pathway. Keeping your skin supple and smooth means you look, and feel, healthy. The natural ingredients are chosen to repair skin damage. And Hiking For Her always encourages self care rituals, especially when they nip foot problems in the bud. Many, many buds were harvested to create this foot butter just for you! A big thank you to Dr. Jones for the opportunity to gather a bit of subjective data for this Colorado Aromatics foot butter review. If you have any questions about my experience with this product, you can contact me here. Read my review of Colorado Aromatics Joint Jam for hiking aches and pains here. And if you need more self care tips, these will keep you in top form to tackle any trail. Happy feet bring happy trails!